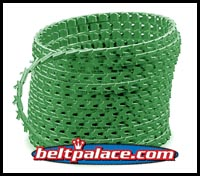 100' Roll of Link V Belt - B Section (5L) | Spool of 100 Feet B-BX-5L Section Link V Belting. 0.66" Top Width. 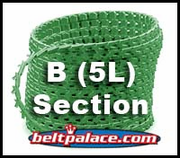 Link V Belt: Sold as Spool of 100 Feet B-BX-5L Section Link V Belting. Link V Belt: B Section (5L): Sold as Spool of 100 Feet (30.48 Meters) B-BX-5L Section Link V Belting. 0.66" Top Width. Duro-Drive Link V-Belt, Polyurethane. Call (317) 519-9020 for Availability and Ordering assistance!